(Nanowerk News) Multi-axis motion and positioning systems are often used for precision automation and alignment applications in fields including optics, photonics, aerospace, medical engineering, and laser technology. Here, positioning accuracy down to the sub-micrometer and even nanometer level is often required - in multiple axes. Hexapod parallel-kinematic motion and positioning systems provide a novel approach to multi-axis motion, combining precision and compactness with versatility. 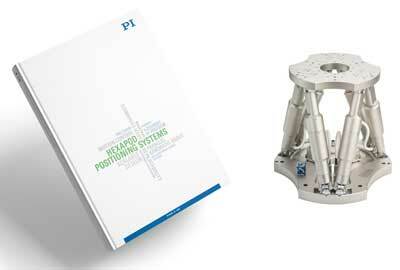 PI's new 130 page catalog provides background information and features a variety of Hexapod (Stewart-Platform) motion and positioning systems with 6 degrees of freedom and high resolution and repeatability in the sub-micrometer and even nanometer range. Hexapods are available with travel ranges from ½ inch to several hundred millimeters and load ranges from 0.5kg to several tons. Hexapods can be optimized for high load, high precision and high speed. Depending on the load, speed, and precision class, electrodynamic, electromechanical or piezoelectric drives are employed. High-speed, direct-drive hexapods are used for motion simulation applications from reproducing hand tremors for camera stabilization to ship motion analysis. All PI hexapods shown in the new catalog are operated with dedicated state-of-the-art motion controllers and software. The required coordinate transformations are handled inside the controller and are transparent to the user - all motions are programmed in XYZ linear coordinates and Theta-X, Theta-Y, and Theta-Z Rotations. In addition, user defined coordinate systems and a user programmable center of rotation (pivot point) enhance the usability. Application examples of hexapod Stewart platforms include precision automated alignment in optics, photonics, medical design, robotics, aeronautics and astronomy, camera lens manufacturing, etc.